Southern Vipers’ bid to repeat their success of 2016 in the Kia Super League began with an impressive seven-wicket win over Surrey Stars at Guildford. 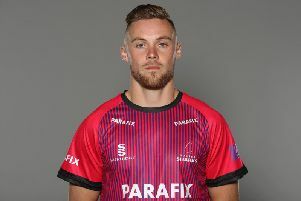 Beaumont said, “It was a bit strange playing against my old team but I had to put that out of my mind and I was really pleased with the way I batted. After the intensity of the international season it is slightly less pressure but you always want to do well for a new team and I thought we played really well. Surrey’s total of 141 for 8 always looked light with a parched lightning-fast outfield giving batsmen full value for their shots. Dunkley and Dane van Niekerk, one of three South Africans in the Surrey team, added 63 in 9.4 overs with Dunkley the dominant partner. She wasn’t afraid to come down the pitch against the spinners and hit straight. Dunkley lofted Paige Schofield down the ground for six and her ten boundaries included one straight drive that perfectly dissected two fielders on the rope standing no more than 20 yards apart. Van Niekerk contributed 31 but, like Dunkley, she fell to off-spinner Fi Morris. The 24-year-old’s first victim was Surrey captain Nat Sciver, who mis-timed a drive to mid-off in the fourth over. Tash Farrant picked up wickets in her first two overs and swung the new ball impressively, bowling Lizelle Lee off an inside edge and then claiming the prized scalp of Sarah Taylor (6), who was bowled through the gate on her Surrey debut. With Amelia Kerr removing Bryony Smith in the second over when she picked out extra cover Vipers had made the best possible start. Surrey needed early wickets to give themselves a chance and claimed both openers in the first four overs. Marizanne Kapp got one to nip back through Wyatt’s defences and four balls later claimed the crucial wicket of skipper Suzie Bates, courtesy of a brilliant catch at backward point by Lee. But that was as good as it got for the Stars. Sophia Dunkley added, “Even though we were in a bit of trouble when I came in I was determined to play my normal game which is to try and be aggressive and to get on top of the bowling and I really enjoyed it out there. “I thought we dragged it back pretty well but the pitch was good to bat on and the outfield is so fast and we were probably a few runs short.